A new movie tracks the plight of young people growing up in today’s media-saturated environment by allowing its subjects to control the camera. At the center of the story, an alienated teen documents his own life as he emerges from his shell with the realization that he possesses special powers. Anyone with a working knowledge of new releases may assume this movie is “Chronicle,” but in fact a far more accurate encapsulation of the same basic ideas was on display last week at the Sundance Film Festival ahead of its air date on HBO: “Me @the Zoo,” a highly personal, diary-like account of Chris “Leave Britney alone!” Crocker’s rise to YouTube celebrity. On the surface, the two movies have virtually nothing in common. Crocker’s initially reclusive nature took a sharp turn when his web videos exploded into viral phenomenon, thrusting him into the national spotlight with alternately dazzling and catastrophic results. The gay teen’s own chronicle symbolizes the distinctive nature of 21st-century stardom, an uncharted terrain in which the mob mentality of online commenters can steamroll anyone — with no accounting for the potential trauma. And then there’s “Chronicle,” a snazzy blend of “Cloverfield,” “X-Men” and “Super 8” about a couple of high schoolers who learn they have actual superpowers. And yet: Comparing the two movies reveals just how radically mainstream tolerance for amateur footage has strengthened over the past decade. In 1967, Jim McBride’s faux documentary “David Holzman’s Diary,” which took the form of a New York loser’s attempt to record every detail of his mundane urban life, ticked off most audiences while gaining steady critical acclaim. Today, the same approach can be found at your local multiplex this weekend, beefed up with special effects but still delivered with the same intentionally lackadaisical production values. The familiarity of this approach has leveled the playing field to the point that studios have begun to emulate the everyman: Crocker’s flamboyant first-person videos anticipated the current surge of “found footage” escapism, which also includes the recent Sundance premiere “V/H/S” and “Paranormal Activity 3.” Unlike “The Blair Witch Project,” these movies are exclusively defined by an ongoing attempt to record every moment. You never forget the camera is there. The found-footage genre opens up an excuse for rawer, more erratic storytelling methods. 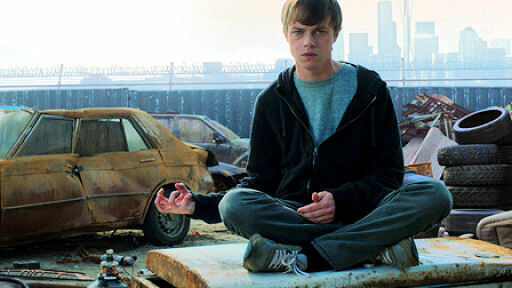 In “Chronicle,” director Josh Trank uses jump cuts, diegetic sound and unorthodox framing strategies to follow the increasingly fantastical journey that Andrew (Dane DeHaan), his cousin Matt (Alex Russell) and Steve (Michael B. Jordan) experience when they suddenly encounter a strange force that endows them with telekinesis. The movie maintains a consistently energizing feel as it brings us an intimate view of the boys’ developing abilities, from constructing Lego sets with their minds to playing football in the clouds once they figure out how to fly. On a technical level, “Chronicle” offers plenty of marvelous feats, but narratively speaking, it grows increasingly problematic: Finding a phenomenal expression for his frustrations, Andrew devolves into a sociopath while his bland, attractive cousin Matt nabs the spotlight as the hero. This is the anti-Crocker story, where the outsider’s realization that he’s special only further ostracizes him. It’s a sad confirmation of commercial favoritism that calls for a classic Crocker takedown: Leave conventions alone, he might say. Crocker showed up at Sundance this year to promote “Me at the Zoo,” which was directed by Chris Moukarbel and Verlie Veatch mainly as a collage of videos and news reports. HBO plans to air the movie later this year, but may need to add a final chapter. Crocker has grown up significantly since the world last saw him, and his current activities include an attempt to launch a gay-straight alliance movement in the south. He learned the hard way that great power invites great responsibility. If “Chronicle” channels that ethos into a flawed cautionary tale, “Me at the Zoo” establishes a more credible hero.